Are you a trucker, frequent boater or spend lots of time traveling in your RV? 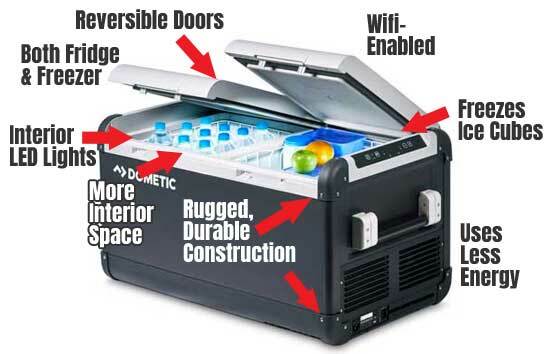 You will probably appreciate this Dometic cooler more, due to its more advanced capabilities. First of all, the freezer can make ice. Plus water freezes into cubes in just about 2.5-3 hours. Second, you can control the temperature on both the refrigerator and freezer sides remotely using your phone and Dometic’s wifi app. Some people may not care about this feature, that is, until you can’t access your cooler for a long period of time and want to adjust the temp. Of course, you can also see that the Dometic has temperature controls on the exterior of the unit as well. 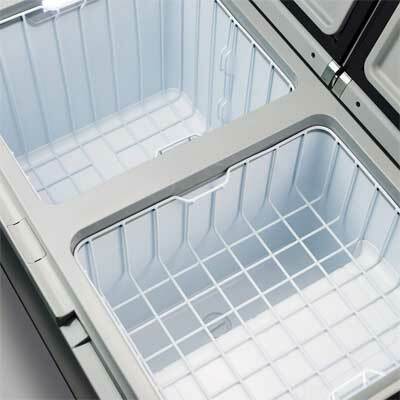 Third, both compartments have a convenient light that automatically turns on when you lift the cooler door. Whether you need to grab the ice cream at night or in a dimly-lit location, this feature comes in super handy. Having said that, you can buy an even bigger cooler with 20 additional liters of space. Check out the Dometic CFA 95DZW, which has a higher price but only costs about $100 more. Note: Keep in mind, however, that unless you need that additional cooling space, you may want to opt for the cheaper version. Here’s why. (1) Larger coolers cost more and require more energy to run. (2) It will take longer to chill the interior contents if you have lots of unused “air space”. 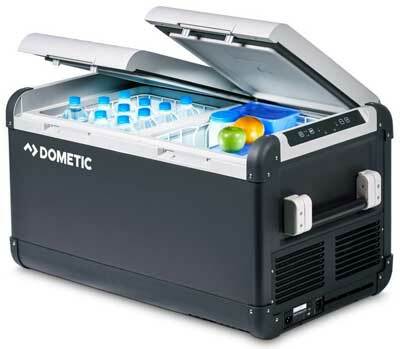 The Dometic CFX 75DZW Fridge Freezer can run off of AC, DC and solar power. Plus, the high performance compressor reaches –7 °F (–22 °C) without using a lot of minimal energy. Note: You can even charge small electronic devices through the cooler itself! Go on long trips or go off grid without worrying about your cooer draining your car battery. 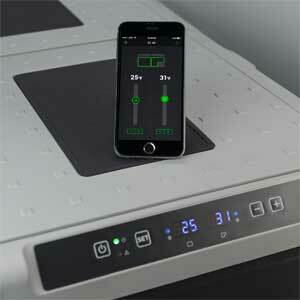 In fact, Dometic built in a 3-stage Dynamic Battery Protection System. In other words, it automatically shuts off your cooler to prevent your car battery from going dead. 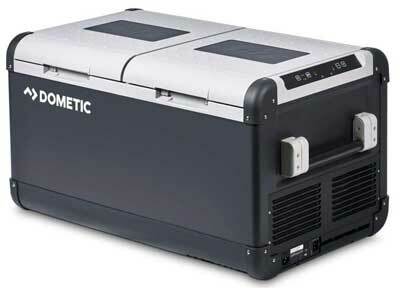 The video below explains more of the Dometic CFX 75DZW features and how to operate the unit. For example, instructions for how to configure the cooler lids. Plus, you can see the bottom mountain points. In addition, it shows a quick demonstration of how the wifi app works and how to adjust the temperature from your wireless device. Note: By the way, you can flip the doors on top of the cooler to open in either direction. Therefore, if you have limitations as far as where you can mount your cooler in your vehicle, this cooler offer some versatility. If you want a slide mount for your Dometic cooler, you can get it here. These sliding brackets make it much easier to access your cooler if you build it into a cabinet, under a seat or a bed. 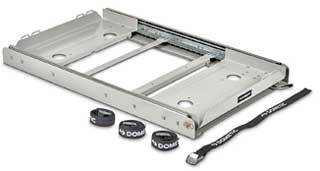 This heavy-duty slide mount can hold up to 220 lbs and is specifically designed by Dometic to fit this particular fridge-freezer. If your vehicle has limited space, this slide can really help. First, the advanced compressor system uses minimal energy while still providing optimal cooling performance. Second, higher-end (and better quality) electric coolers typically last longer. Therefore, you get more use and don’t need to replace them as frequently. Third, according to the manufacturer, you can operate portable fridge freezers at a higher temperature than your home refrigerator. Therefore, it costs less to operate the device. A few degrees difference shows to be adequate. Fourth, as I mentioned above, you can cut down on operating costs (and sales price) by getting the 75DZW vs the 95DZW. Finally, you can save $150 simply by purchasing the unit on Amazon compared to Dometic’s own website.